On the morning of February 11, 1943, a flight of four P-47B Thunderbolts took off from Hillsgrove Army Air Field in Warwick, Rhode Island, for what was to be a routine half-hour flight to Trumbull Field in Groton, Connecticut. None of them ever arrived at their destination. Conditions were foggy that morning, with a cloud ceiling of only 900 feet. Once airborne the pilots would have to rely on their instruments to get them where they were going. The flight leader was 1st Lieutenant Gene F. Drake. The other three pilots, all second lieutenants, were Raymond D. Burke, Robert F. Meyer, and John Pavlovic. All were assigned to the 21st Fighter Squadron of the 352nd Fighter Group. The 352nd was a newly formed unit then based at Trumbull Field. The flight took off at 10:15 a.m. with Lieutenant Drake flying aircraft #41-5922, Lieutenant Burke, #41-5943, Lieutenant Mayer, #41-5940, and Lieutenant Pavlovic, #41-5944. Witnesses later reported that the formation circled the airfield three times, but by the third pass one of the planes had disappeared. The remaining three P-47s were last seen headed in a southerly direction. The missing plane was piloted by Lieutenant Mayer. 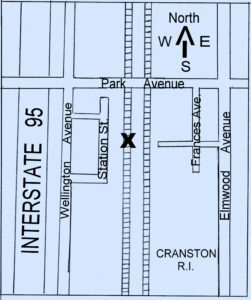 How he became separated for the group is unclear, but just minutes after take-off he crashed on some railroad tracks in the city of Cranston, Rhode Island, which borders Warwick to the north. Witnesses stated the right wing of Lt. Mayer’s aircraft struck a boxcar parked on a siding which caused it to crash and burn. Lt. Mayer was likely killed instantly. The site of the crash was located just south of Park Avenue, about four miles from Hillsgrove Field. Meanwhile, the other three P-47 pilots were heading southeast in zero visibility towards Jamestown and Newport instead of southwest towards Connecticut. Shortly before 11:00 a.m. Lieutenant Raymond Burke crashed in the waters of Narragansett Bay between Jamestown and Newport on the eastern side of the island. (For those unaware, the town of Jamestown is located on Conanicut Island, situated in the middle of Narragansett Bay.) A short time later, one of the other P-47s crashed on the western side of the island, just off shore from Fort Getty, where the 243rd Coast Artillery was stationed. One serviceman who was stationed at Fort Getty was 2nd Lieutenant Roland D. Appleton who reported hearing a low flying aircraft pass over his duty station and then a loud crash out over the water a short distance from shore. Several enlisted men also reported hearing the same, but due to heavy fog nothing had been observed. However, within a few minutes the scent of gasoline wafted to shore confirming what they all suspected. By this point, the military was dealing with two downed aircraft, one on either side of the island. Lieutenant Appleton’s statement continued, “Within 10 or 15 minutes the fog lifted and I searched the area with field glasses but did not discover any signs of the plane. A report was received that an oil or gas slick was sighted about 500 yards off shore and that the gas odor was still strong. The shore patrol continued searching. It is believed by the undersigned that the plane crashed and sank within a very few minutes. Approximately an hour and a half after the crash a black canvas bag about 15 inches long filled with cotton was picked up on shore. The center of the cotton was dry which indicated to me that it had been in the water but a short time. Other articles picked up on shore included a piece of leather possibly from an earphone, four rubber pieces of peculiar design, a handkerchief with numbers on it. Unfortunately, the numbers on the handkerchief were not recorded in the investigation report. The following day, February 12th, The Newport Daily News reported that the body of Lieutenant Raymond Burke had been recovered from the bay between Jamestown and Newport by a navy picket boat and taken to Newport Hospital. On February 13th, a small news item appeared in The Woonsocket Call concerning the other plane that had crashed off Fort Getty. 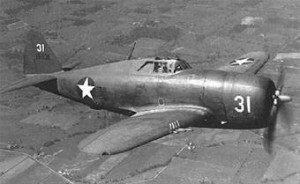 It reported that the unidentified P-47 had been located in 58 feet of water, but that the pilot was still unaccounted for. The unidentified plane was marked with a buoy and a salvage boat was sent to attempt a recovery, however, bad weather and floating ice prevented this from happening. Unfortunately, the aircraft and its pilot were never identified in either newspaper accounts, or the official investigation report, nor does it appear that the pilot or the aircraft were ever recovered. Therefore, it has never been determined if this aircraft was the one flown by Lt. Pavlovic, or Lt. Burke. The fate of the fourth P-47 of this flight has never been determined, for the pilot and his aircraft were never seen or head from again. Presumably, the pilot continued on a southeasterly course and flew out to sea. 1st Lieutenant Gene Frederick Drake, (Ser. # O-430925), was from Wilmette, Illinois, born August 3, 1920. He enlisted in the Air Corps in March 17, 1941, (Some sources state February, 1941), about ten months before the United States entered World War II. From January to November of 1942, he served in Australia flying combat missions against the Japanese. On his 22nd birthday, (Aug. 3, 1942), he was flying a patrol mission when he and his fellow fighter pilots spotted 27 enemy bombers flying in formation approximately 2,00o feet below. Lt. Drake was forced to bail but he landed safely. Lt. drake was credited with shooting down the enemy bomber, as well as two more Japanese aircraft later that same month. For his outstanding service he was awarded the Oak Leaf Cluster for gallantry in action under heavy fire, the Purple Heart, and the Silver Star. In late 1942 he returned to the states and became a flight instructor, training new pilots for overseas duty. He was survived by his wife Shirley, and his son, Gene Jr.. He was officially declared dead on January 31, 1944. Lt. Drake also had a brother serving in the Marine Corps, 1st Lt. Stafford W. Drake Jr.
2nd Lieutenant Robert Frederick Meyer was born January 29, 1920, in Shepherd, Michigan, making him just barely 23 at the time of his death. He was survived by his parents, and is buried in Deepdale Memorial Park, Lansing, Michigan. 2nd Lieutenant Raymond D. Burke was just 15 days shy of his 22nd birthday when he died. He was born in Wilton, New Hampshire, February 26, 1921, the son of James R. and Margaret E. Burke. He’s buried in Mt. Calvary Cemetery in Wilton. 2nd Lieutenant John Pavlovic, (Ser. # O-732341), was from the town of River Forrest, Illinois, and was 23-years-old at the time of his death. He entered the Air Corps in March, 1942, and was commissioned a 2nd Lieutenant in October of 1942 at Luke Field in Arizona. He was officially declared dead one year after his disappearance.